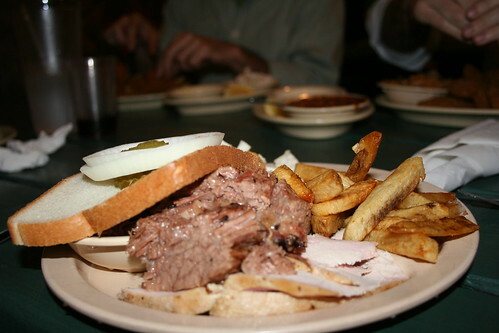 Today we talked about the best BBQ within the Austin City Limits. If you listened, you know that I was pushing hard to talk about BBQ in Texas, or at least Central Texas. Andy wanted to talk about where you might take an out-of-towner if they didn’t have time to drive 20 minutes outside of Austin to hit the Salt Lick or Smitty’s or Kreutz or Snow’s. My picks are Green Mesquite for down home BBQ and Lockhart if you don’t mind your BBQ a little on the fancy side. Check out the Tasty Tuesday post for more recommendations. This beautiful photo of a meat plate at Green Mesquite was taken by my friend Emily G., photographer and author of the blog Wild and Crazy Pearl.